The Spiry Collection is ironic and playful, almost like a spinning top released into the air. The fiery red cable that supports the light is a touch of contrasting color that makes it attractively young and modern. 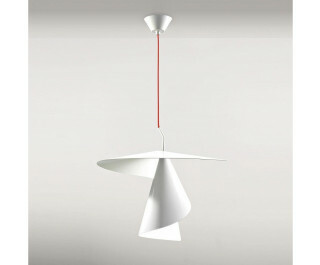 The Spiry Pendant is available in a white painted aluminum finish. Ships with 70" of cord. Axo Light is one of the most dynamic companies in the rich and complex world of Italian design. Created in the inland Venice area in 1996, from the outset it combined Italian passion for design with a strong international focus and soon became one of the leading companies in the high quality indoor lighting sector. Inspired by the Venetian tradition of glass making, Axo Light has explored the widest possible range of working methods and innovative materials among which bamboo, crystal, fabric, ceramics, metal, cast aluminum and injected ABS. Axo Light offers three extremely striking ranges to suit any environment, whether modern or traditional, public or private. The Axo Light range, real light icons whose distinctive feature is their elegant manufacture, combined with attention to detail. The Lightecture range, created for large spaces, made up of five product families with standard sizes up to 180 cm; avant-garde, high tech lighting solutions in line with the growing demand for energy saving light sources. The Mind-led range, a high-tech, emotional collection designed for clients linked to the technical sector who are sensitive to the aesthetic value of lighting (architects and lighting designers, etc).